In 1928, Walt Disney was looking for a new bankable character. After several brainstorming sessions with his animators, a mouse emerged. Disney suggested they name him "Mortimer," but they settled on "Mickey" instead. 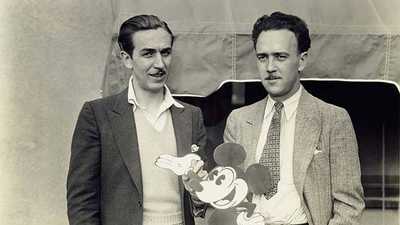 Disney's lead animator, Ub Iwerks, took charge of the mouse’s look, while Walt Disney gave him his personality and voice. After the 1928 premiere of "Steamboat Willie," Mickey Mouse was a hit. 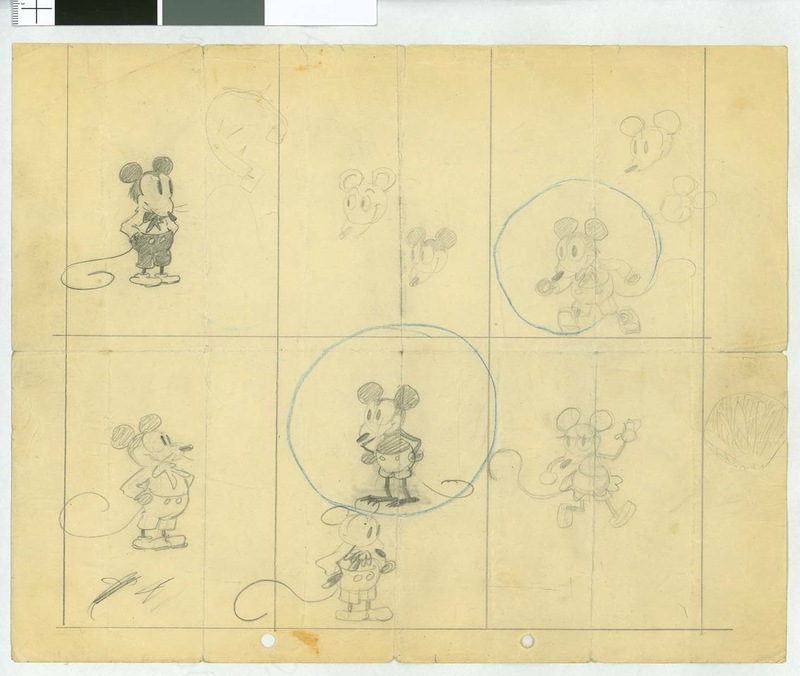 Walt Disney used innovative sound techniques that made his Mickey Mouse cartoons stand out from other animated shorts. He and Roy also gained a steady stream of revenue through licensing. Though the studio kept a tight rein on how their mouse could be used and they demanded a big cut of the profits, they had plenty of willing partners because Mickey Mouse moved merchandise. As the country descended into the Great Depression in the late 1920s and early '30s, Mickey Mouse's popularity continued to grow as millions of children signed up for Mickey Mouse Clubs. 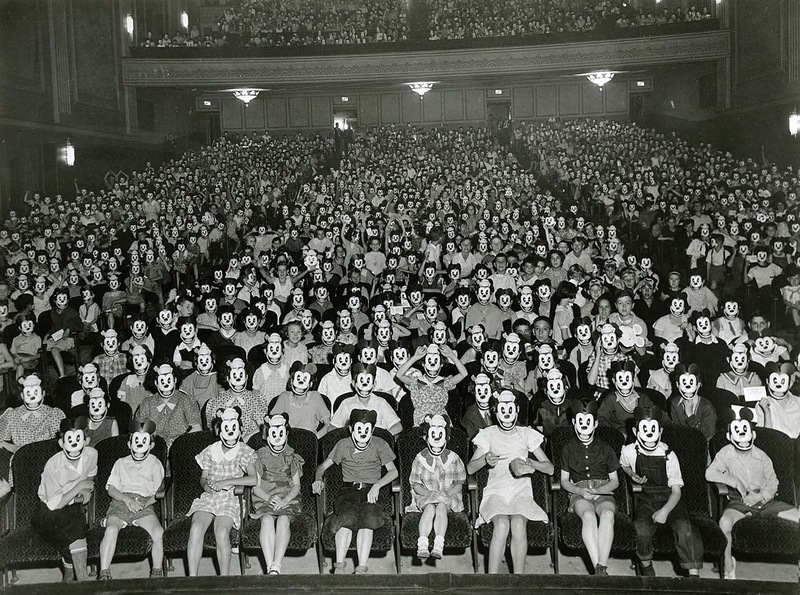 Here, audience members don Mickey Mouse masks in 1933. Like most studios in the 1930s, men held the top-level positions at Walt Disney Studios; the women who came to work there were largely relegated to the lower-wage ink-and-paint department. But during the Great Depression, few complained about a steady job with steady pay. 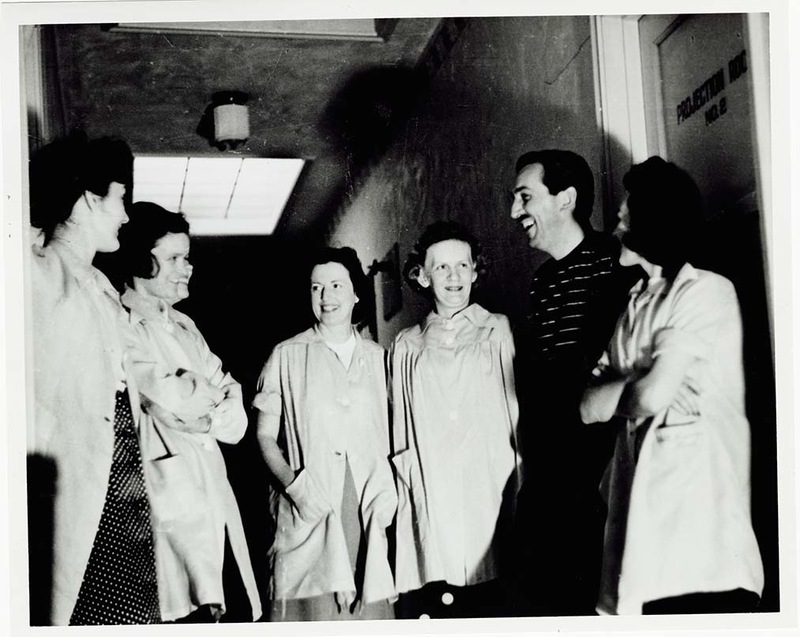 Here, Walt Disney chats with some of the ink-and-paint employees at his Hyperion Studios, August 25, 1939. In 1934, Walt Disney began his most ambitious project yet: a full-length, story-driven cartoon. Such a project had never been attempted before, and Disney insisted on technical innovation, attention to detail, and getting the story right. 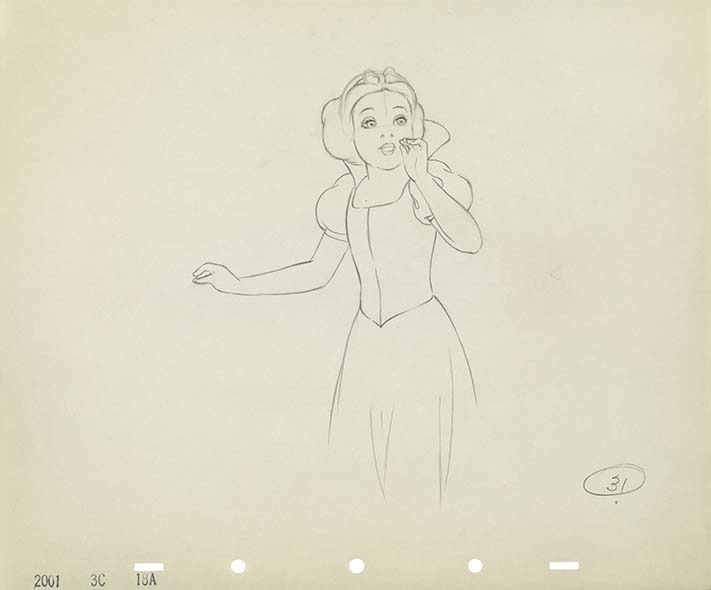 Snow White and the Seven Dwarfs would exceed its original budget estimate by a factor of six, take nearly four years to make, and require more than 200,000 separate drawings. Walt Disney insisted that the way to make audiences emotionally invested in a feature-length animated film was to infuse it with natural realism. For Snow White and the Seven Dwarfs, Disney hired a teenage dancer named Marjorie Belcher to act the part of Snow White so his animators could study how she looked when she leaned over, laughed, or smiled. 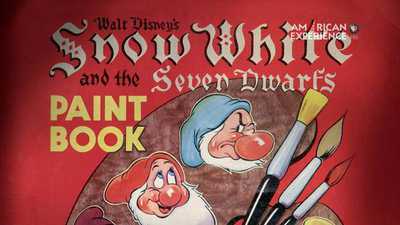 Snow White and the Seven Dwarfs premiered in Hollywood on December 21, 1937. It grossed at least $8 million in its first year–the equivalent of over $100 million today, and more than any film before it. 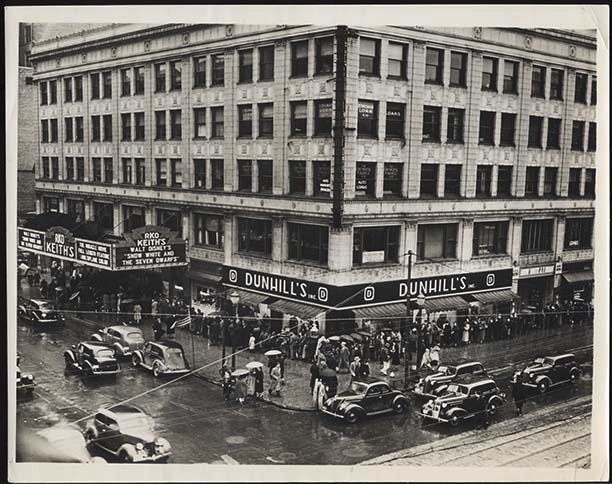 Lines for the film wrapped around the block at small-town theaters like the RKO Keith's theatre in Dayton, Ohio, 1938. Not only was Snow White and the Seven Dwarfs a box office smash, but it also provided a steady stream of merchandising revenue. With the influx of cash, the studio was able to pay off their $2.3 million debt to Bank of America. 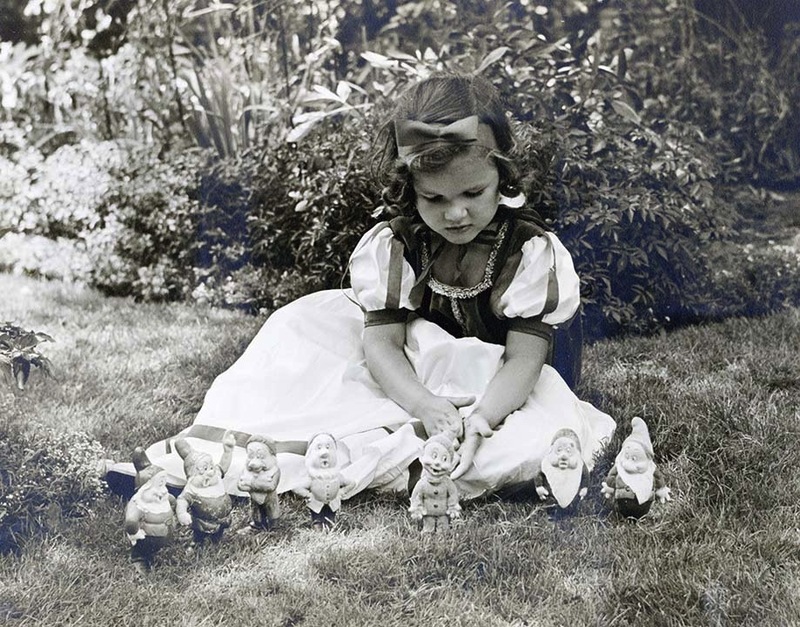 Here, a little girl dressed as Snow White plays with her Seven Dwarfs dolls. 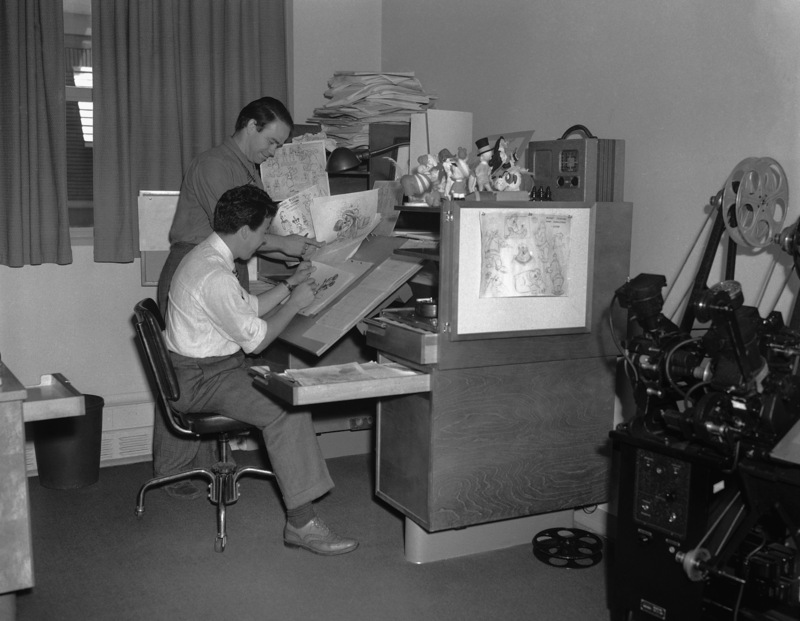 Walt Disney dreamed of producing a new feature-length animation every six months. One of these projects was Pinocchio, based on a popular Italian folktale from the late 19th century. The film premiered on February 7, 1940, 18 months after its original release date. 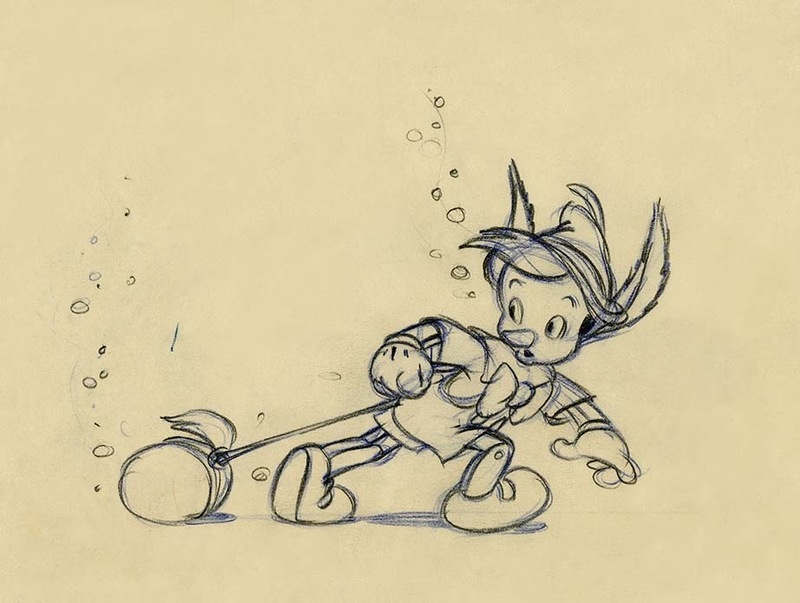 Despite its use of innovative techniques in underwater effects and personality animation, it was not an immediate commercial success like Snow White and the Seven Dwarfs. Walt Disney's Fantasia had begun as a cartoon short starring Mickey Mouse, with the backing of an orchestra conducted by the celebrated Leopold Stokowski (far right). But Disney was so taken with the first results that he decided to expand it into a feature-length film. 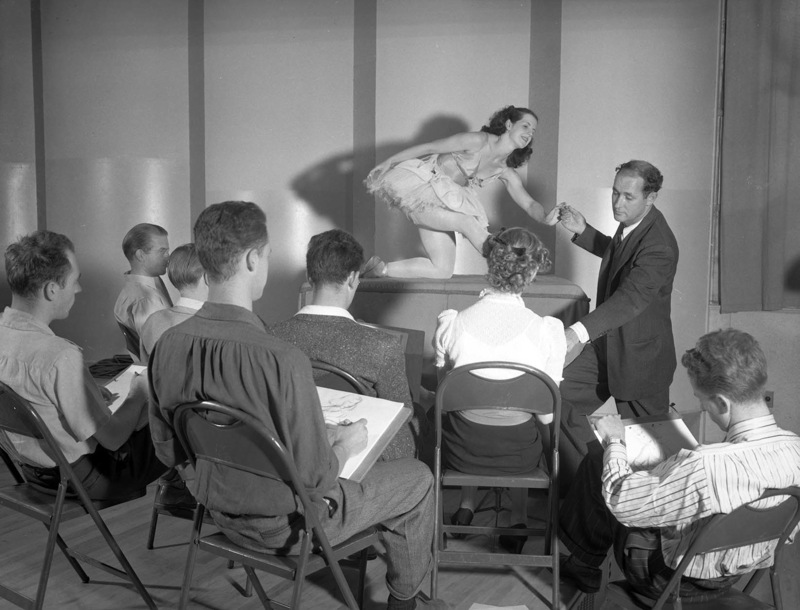 Disney brought in musicians, dancers, even famous scientists like the astronomer Edwin Hubble, to lend their expertise to the film's imagery. 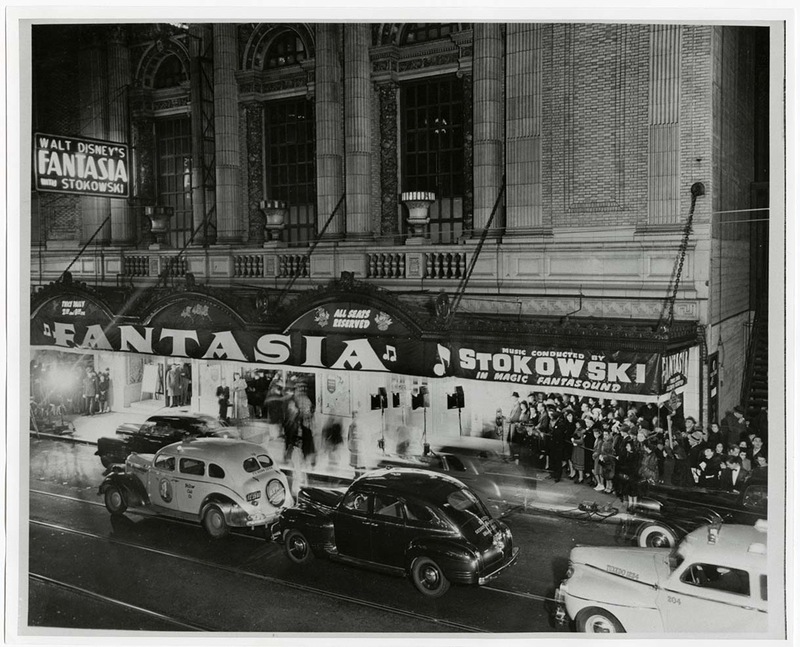 Fantasia premiered in November 1940 to mixed reviews. Some critics thought the film was innovative and compelling while others called it a "nightmare." The financial losses for Fantasia were far greater than Pinocchio's, largely because so few theaters had the expensive new sound system Disney required to show his film-symphony. 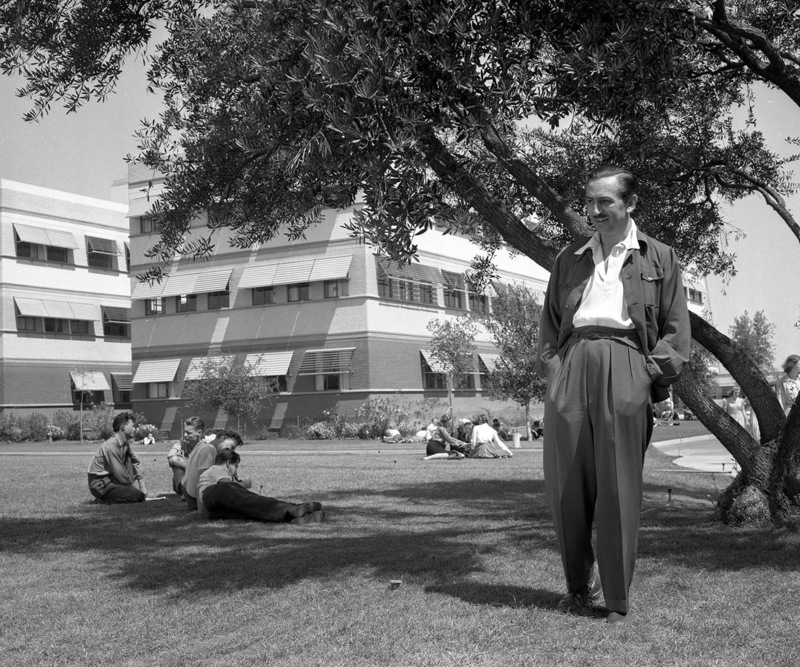 By the end of 1939, the construction of Walt Disney's studios in Burbank was complete. Disney designed the new headquarters to maximize efficiency and to create a larger sense of community in the ever-growing "Disney family." As former ink-and-paint artist Ruth Tompson remarked, "Boss? He wasn’t boss. He was a friend. And everybody called him Walt." 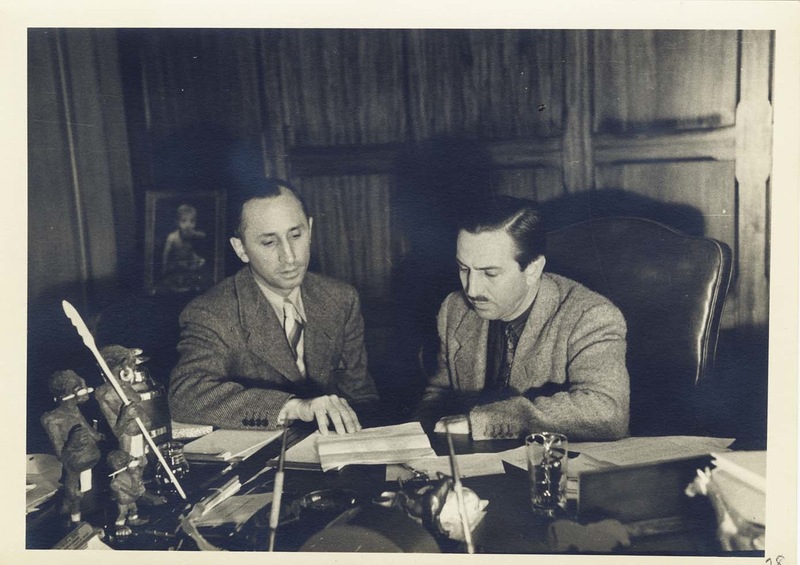 In April 1940, facing high costs from the Burbank studio construction and low revenue from Pinocchio, Walt Disney Productions went public, issuing 155,000 shares of preferred stock, which netted the company nearly $4 million. Roy Disney was guaranteed a salary of $1,000 per week and Walt $2,000. 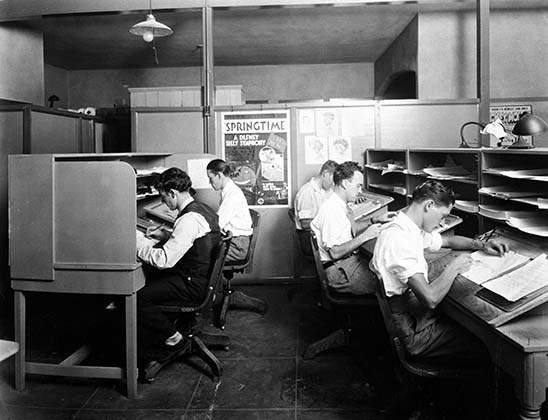 In May 1941 nearly half of the studio’s art department, including some of Disney’s most trusted animators, went on strike demanding better wages, extra pay for overtime, and a uniform system for determining job titles and screen credits. 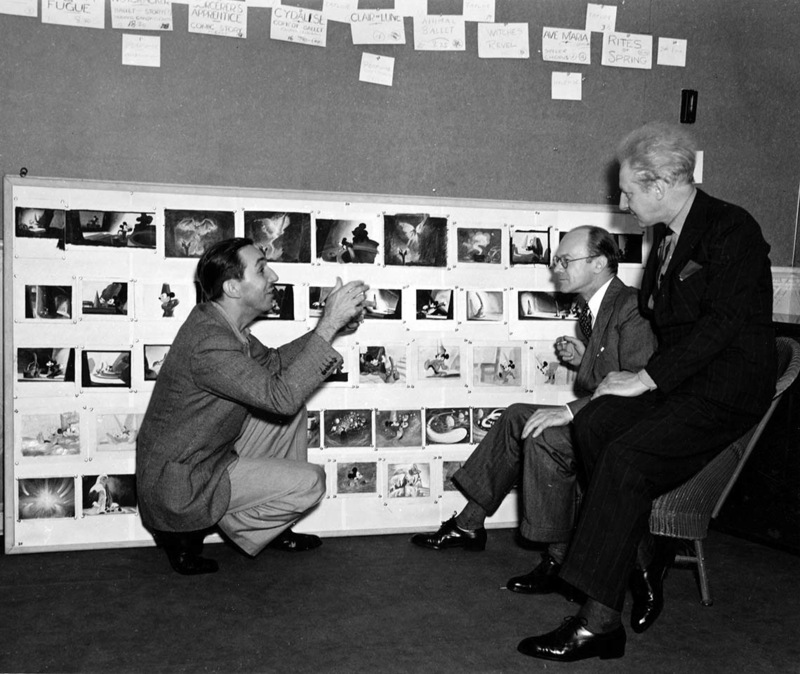 Despite the strike, several animators continued to work on Walt Disney's full-length features, Dumbo and Bambi. 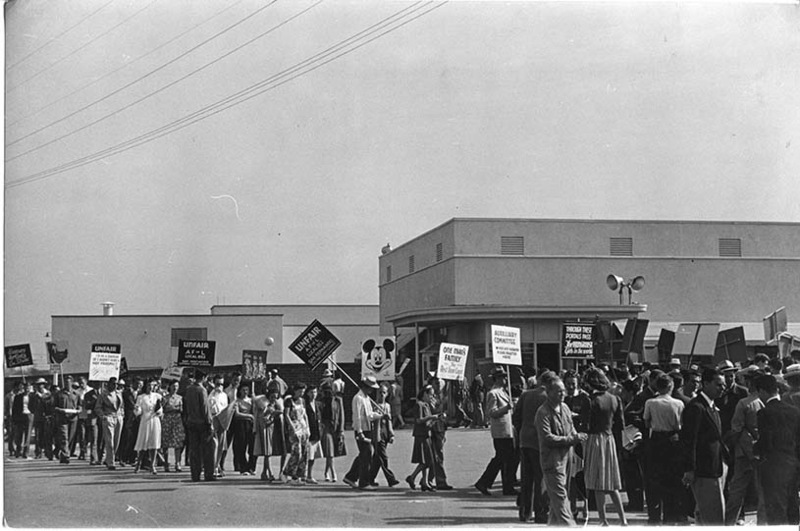 As he crossed the picket line, animator Ward Kimball (standing) reportedly told the strikers, "If I don't go in, Dumbo won't get made, and the studio will fail!" In Bambi, Walt Disney strove for a realistic depiction of the natural world in all its beauty and peril. 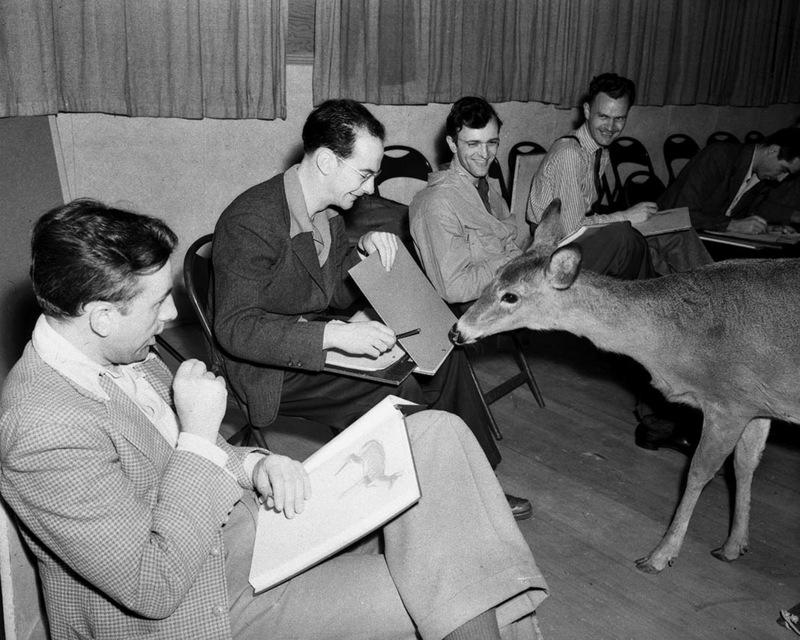 He brought in live deer for his animators to sketch, and sent them to the forest to practice painting backgrounds. Despite the film's artistic ambitions, when it premiered in August 1942, it was not a commercial success. 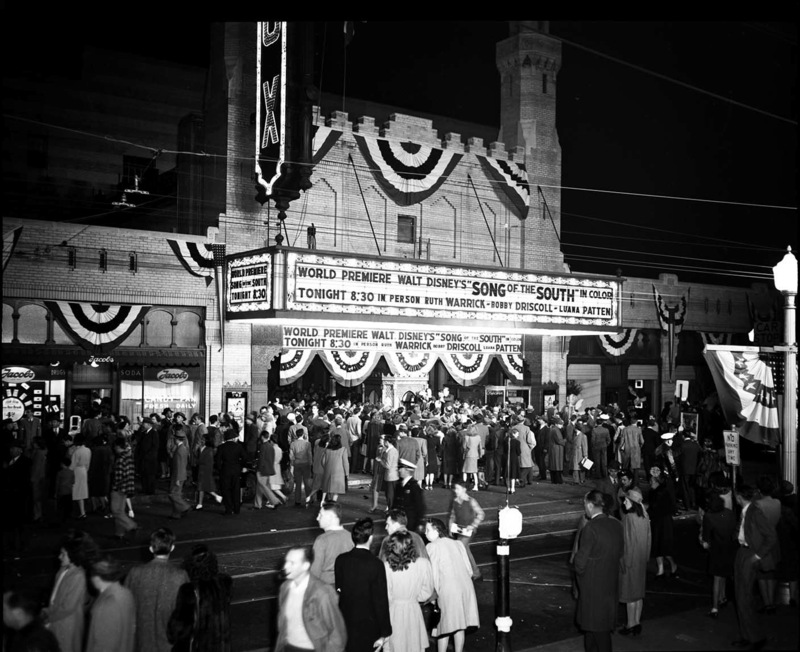 Walt Disney's Song of the South, which mixed live action sequences with animation, premiered in November 1946 at the same Atlanta, GA theater that hosted the Gone With the Wind premiere seven years earlier. Critics gave mixed reviews on Disney's latest film, and the NAACP boycotted the film, stating that it presented a "dangerously glorified picture of slavery." By 1948, Walt Disney was producing more than ever, and he was traveling all over the map in search of the studio's next big thing. 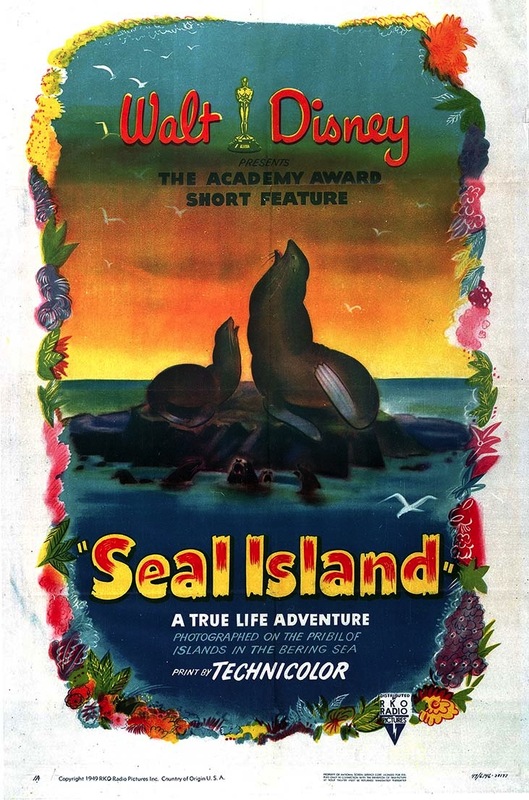 He took his daughter Sharon on a trip to Alaska, the scene of his first nature documentary, Seal Island. The film won an Academy Award, and launched Disney’s new and profitable line of nature documentaries–True-Life Adventures. But Walt was still restless. In the early 1950s, Walt Disney began planning his next big venture, an amusement park where families could walk in the magical worlds his films depicted on the big screen. Originally, he called it "Mickey Mouse Village," but eventually settled on "Disneyland." Pictured is a model of colorful Disneyland Castle photographed as if it were a real building in a presentation book to bankers and businessmen. In October 1954 Walt Disney's television program Disneyland premiered on ABC. 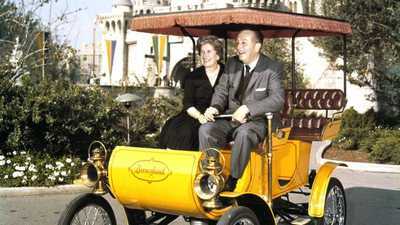 Walt Disney hosted the hour-long show, with each episode mapping onto one of the four realms at the theme park he was building. One fan-favorite was a character from Frontierland: Davy Crockett. 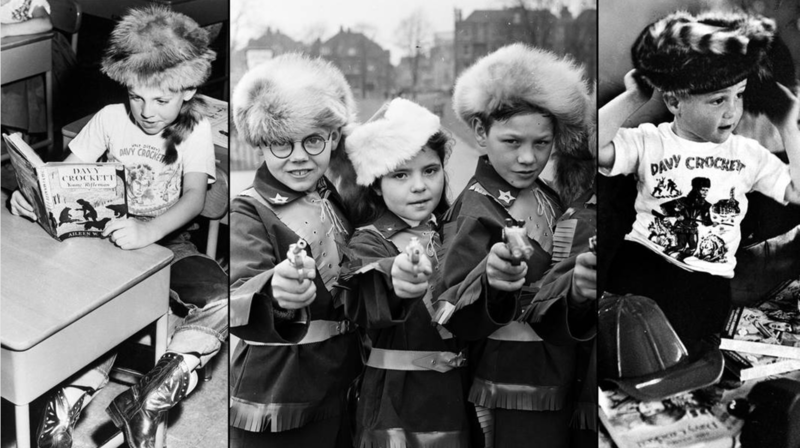 Here, children model the frontier hero's signature coonskin cap and other Davy Crockett merchandise. 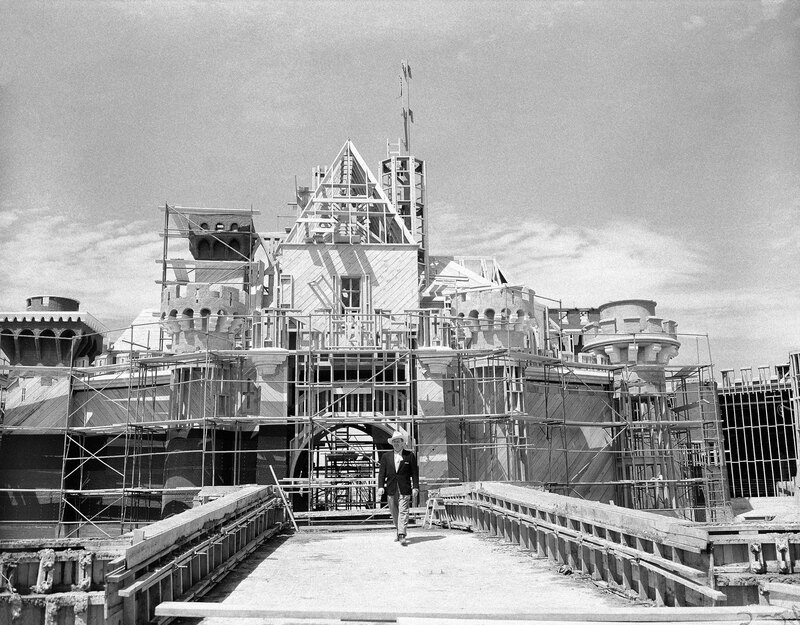 Walt Disney walks on the bridge in front of the partially finished Sleeping Beauty's Castle at Disneyland. 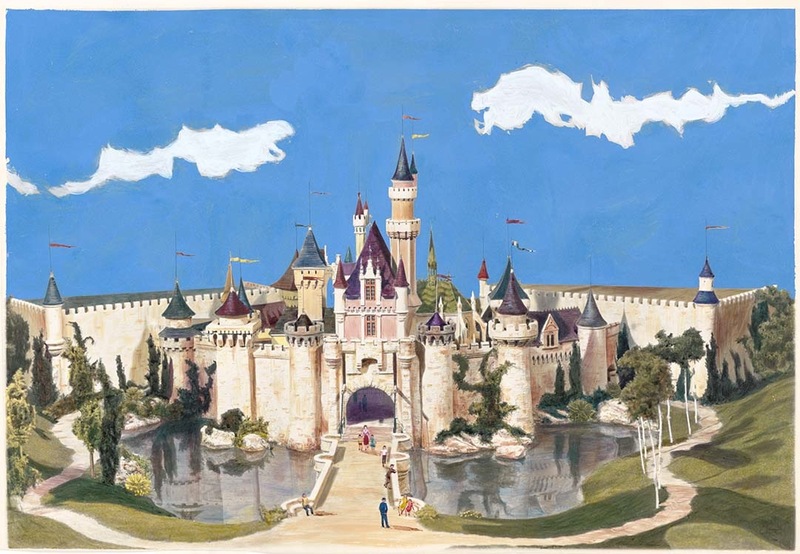 The Bavarian-style castle would tower nearly 80 feet above the Fantasyland section of the park. Disneyland opened on July 17, 1955. The park drew a million visitors in its first two months alone; soon that number would reach five million per year. 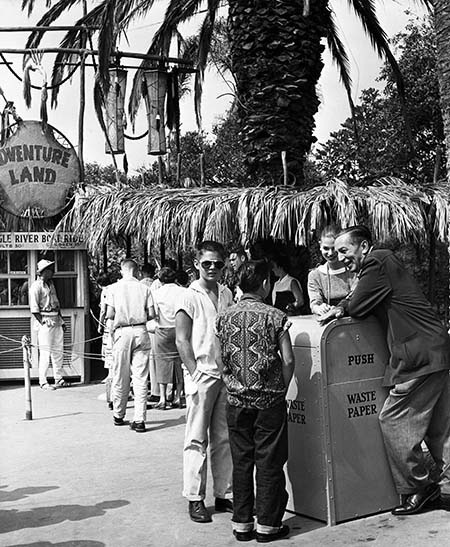 Here, Walt Disney mingles with two young visitors in front of the Jungle Cruise in Adventureland. 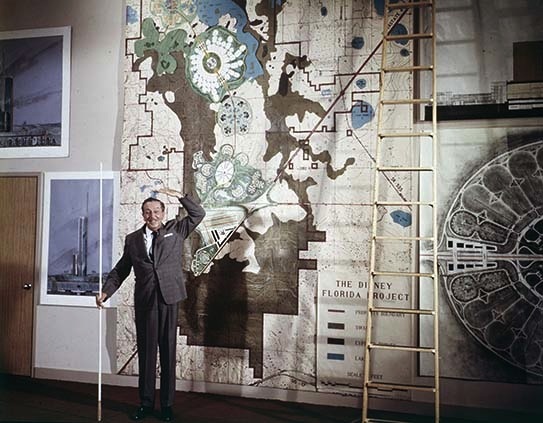 In 1965 Walt Disney began buying up plots of land in central Florida for his new project, the Experimental Prototype Community of Tomorrow, or EPCOT. Here, Walt is on set for a promotional film about Disney World and EPCOT in 1966. He never saw the completion of EPCOT, as he died of lung cancer on December 15, 1966. 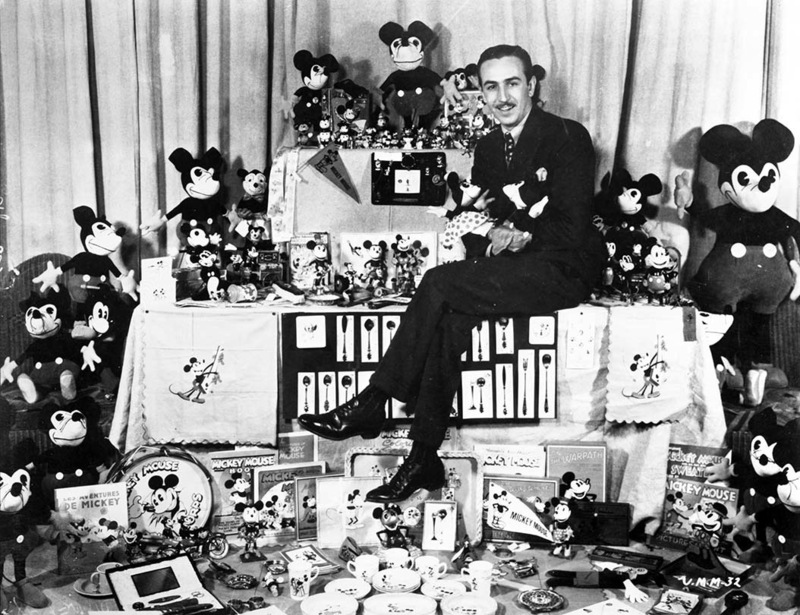 Born in 1901, Walt Disney was an international celebrity by the time he was 30 and hailed a genius before he was 40.